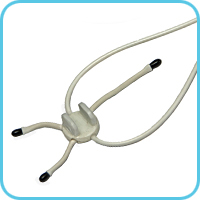 Electroencephalograph-recorder "Encephalan-EEGR-19/26, "Mini" modification in combination with software "Encephalan-PSG" and required wireless modules and sensors is effectively used as polysomnograph . 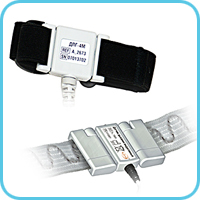 Two variants of polysomnograph based on patient transceiver-recorder ABP-10 provide professional level of sleep diagnostics in compliance with the AASM Standards. 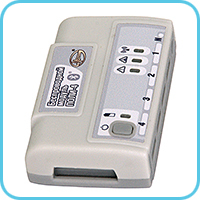 Patient transceiver-recorder ABP-10 allows carrying out studies in telemetric or autonomous (PSG-Holter) mode. 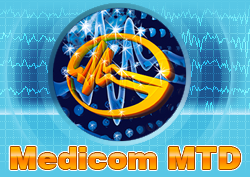 All physiological signals are synchronously recorded and displayed as the result of a single device operation during monitoring or data analyzing. 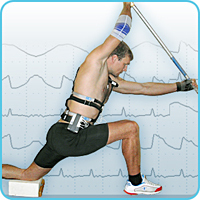 Light weight of device, an option of quick modification of system configuration and high software functionality provide an effective application of the system in sports and occupational medicine, and scientific research. 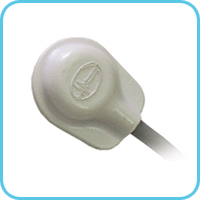 indication of electrode contact quality. 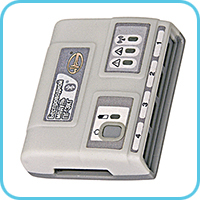 Autonomous patient transceiver-recorder ABP-10 in the telemetric mode provides data transition to a doctor's computer via wireless Bluetooth channel, which eliminates the need for communication cables and allows placing electroencephalograph away from the doctor’s computer everywhere in the doctor’s office or patient’s ward based on the convenience of the study. 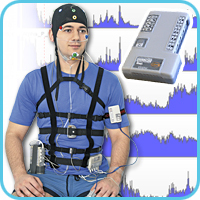 Wireless stimulation control unit provides carrying out of hardware functional tests which are common for routine EEG studies: light and audio stimuli. 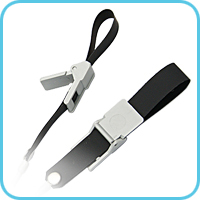 Functional tests for electrostimulation are carried out by means of wireless electrostimulator. 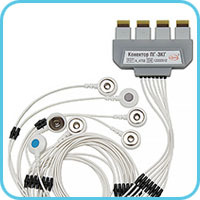 During the short-term EEG-studies EEG-9 connector is connected to the patient transceiver-recorder. 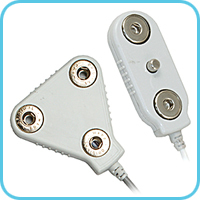 EEG-9 connector allows using EEG electrodes with touchproof connector (cup or bridge electrodes). 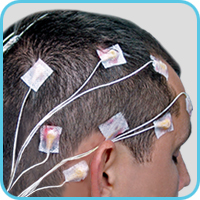 Adhesive EEG electrodes are used during continuous neuromonitoring in the intensive care units and emergency room. 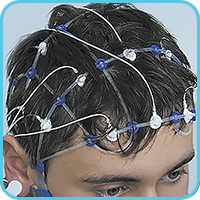 The main software EEG studies "Encephalan-EEGR" provides all the common functionality that is required for EEG record and analysis: monitoring and visual EEG analysis, creation and use of montages and study scenarios, processing with various quantitative methods of EEG analysis, study results presentation, printing, storage in a data-base, etc. 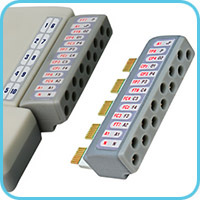 allows alternating data recording in the ambulatory and telemetric mode and provides additional opportunities for functional tests in the telemetric mode. 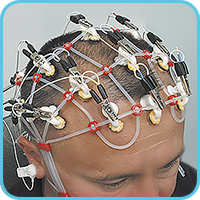 During long-term autonomous ambulatory EEG registration against the background of drug therapy, when it is necessary to carry out functional tests in order to evaluate the dynamics of the patient’s state after taking the medicine. 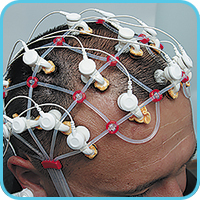 Long-term EEG monitoring of non-transportable patient in any hospital department or during their continuous transportation. 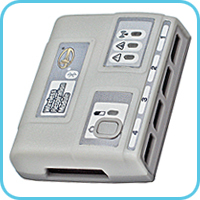 All data is recorded onto the memory card integrated into the patient transceiver-recorder ABP-10. 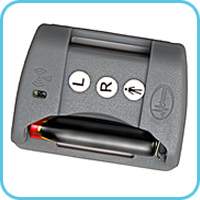 During the research the patient, their relatives and medical staff can use a specialized digital voice recorder – event marker for recording marks and verbal comments on changes in patient's state and digital events logging. 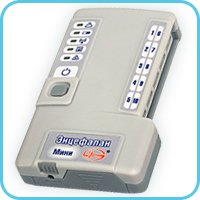 When the study is completed, all the data is transferred from the memory card of patient transceiver-recorder ABP-10 and digital voice recorder to the doctor's computer and accurately synchronized in time. 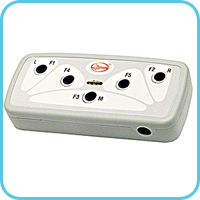 Sales package of electroencephalograph easily fits in a compact carrying case and includes the patient transceiver-recorder ABP-10, phono-photostimulator, a set of electrodes and a portable computer. 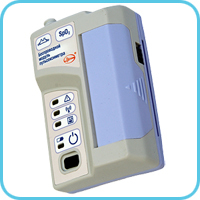 Portability of patient transceiver-recorder ABP-10, backup of all recorded data on the internal memory card and wireless data transmission to the computer provide high reliability and noise immunity when using in the emergency room and intensive care units (including in neonatology). 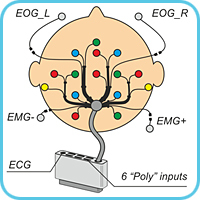 Special connector EEG-9 with defibrillation proof provides stable performance of the electroencephalograph when using a cardiac defibrillator. 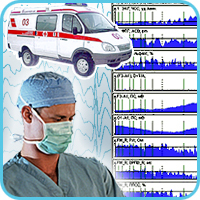 "Encephalan-NM" provides calculation and visualization of trends of different physiological parameters of the CNS, ANS and the cardiorespiratory system in the same time scale with an option of changing the duration of time position from 10 to 300 s.
"Encephalan-CFM" and "Encephalan-NM" can be used separately as optional software to the main software "Encephalan-EEGR", but the most informative and effective monitoring of parameters is provided at their simultaneous operation. "95 percent of thinking takes place in our unconscious minds. We need to use better research methods that penetrate more deeply into the human mind to get what people don’t know and guess at the level of consciousness, but in fact they know it." 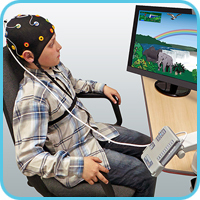 "By looking at the EEG readout we can tell whether they’re disengaged or engaged. And we’ve found that storyline wins every time." 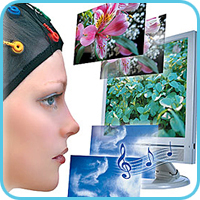 Neuromarketing is a modern developing field of research of consumers' psychology that uses integrated biometric research methods of the brain electrical activity parameters, skin, and muscle movements in order to determine the images, which a focus group reacts most actively to. It helps to build a visual range of incentives more accurately and efficiently taking into account the feelings and emotions of customers for subsequent marketing activities. A rational explanation of consumer choice is not always the real motive. In the most cases, consumers buy an emotion associated with a product rather than its functional characteristics, and then rationalize retroactively their choices. So-called "background sample", namely record of psychophysiological parameters in the normal state when presenting neutral images, is carried out before the main test to calibrate the responses. 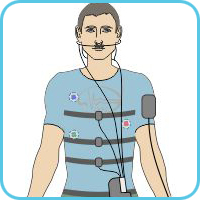 Autonomous patient transceiver-recorder ABP-10 depending on connected modules and sensors records EEG (from 4 to 9 derivations), respiration effort (abdominal and thoracic), heart rate, galvanic skin response, photoplethysmogram, tremor (1-4 sensors). 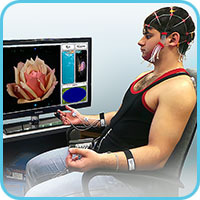 Software "Encephalan-AVS" allows displaying audiovisual images and synchronously recording physiological parameters as well as creating study scenario where significant image (for a test person’s reaction finding out) is being presented at the subconscious perception level during a very short period of time. 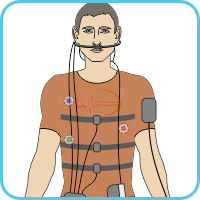 In this case, the test person does not observe this image, but their reaction is observed on the physiological parameters record and can be analyzed. Quantitative methods of EEG analysis available in the main software "Encephalan-EEGR" and "Encephalan-AVS" are applied for experimental data processing with an option of detailed analysis of spatial spectral EEG characteristics and other physiological parameters. After data processing, the researcher will be able to draw conclusions about the emotional involvement of the respondent into viewing, the degree of motivation to action (purchase), the attractiveness of advertising image, as well as about what relationship is established between the consumer and the product - whether it is emotional or rational. Focus group of 8-15 participants is enough to interpret the research results for the target audience. Simultaneous video-record is available for facial expressions fixation. 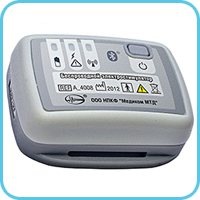 wireless PG-ECG Module (or Poly-4 module) for the record of ECG by 2 derivations or impedance-based pneumogram by 1 derivation for the purpose of cardiorespiratory sleep disorders analysis. Balance training while maintaining an vertical posture on a balance platform. (Only for equipment configurations including patient transceiver-recorder ABP-10). Portable and autonomous equipment (data are transmitted to a computer via telemetric channel or recorded onto a memory card) allows conducting medical and scientific research under various conditions – from a stationary scientific laboratory to field conditions (for example, training process, performance of professional activities at the workplace, etc.). Record can last from several minutes to 24 hours depending on the research task. A large set of sensors and software suite allow recording a wide range of parameters, which characterize work of the major body systems, and analyzing these data using various types of processing. 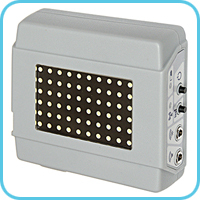 A uniform standard of data communication between wireless modules and standard sensor connector allow creating the required configuration for different experiments. 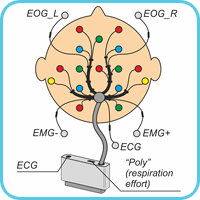 Multiparameter record and analysis of cardiovascular, central and autonomic nervous systems parameters synchronously with EEG. 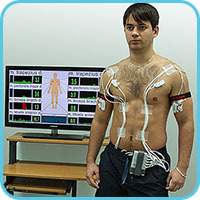 Record of physiological parameters in apparently healthy people is applied as a polyfunctional monitoring in sports medicine, studies of operator performance and scientific research. 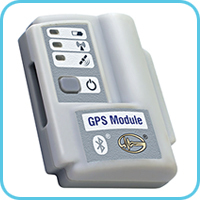 In autonomous mode, equipment set can be supplemented with the module for synchronous recording of spatial movement (GPS module) during dynamic monitoring of physiological parameters at the workplace or the training site. 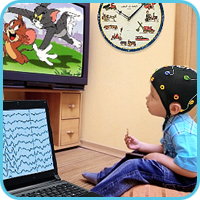 Provides quality record of video data synchronized with EEG for differential diagnosis of epileptic and non-epileptic phenomena. Studies provide patient-friendly environment (a functional diagnostic room, hospital ward or at home). The patient can sleep, eat, read, watch TV, play, etc. A doctor or an assistant monitors their state, operation of the equipment and recording quality. 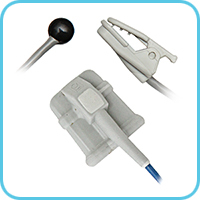 Mobile videomonitoring kit including video camera with portable camera's tripod and easily fitting into an additional bag is used with electroencephalograph-recorder "Mini" modification. The customer is offered several types of mobile videomonitoring kits, which differ in the type of video camera: with night or daylight mode, optical or digital zoom, with rotator or without it, etc. 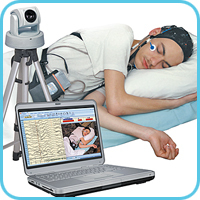 Detailed information about videomonitoring kit and software "Encephalan-Video"
record of patient's events with the button on the video recorder. 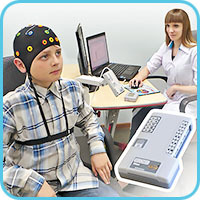 All data recorded onto the internal memory card of the video recorder are accurately synchronized with EEG when transmitted to the computer. 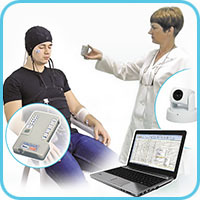 Application of the original autonomous video recorder allows recording clinically significant behavioral episodes and paroxysmal events during continuous autonomous EEG monitoring (Holter-EEG) which, in turn, provides accurate differential diagnosis. 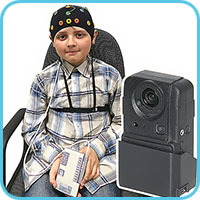 The video recorder is easy to operate and can be used both by medical staff and relatives of the patient during EEG recording at home. 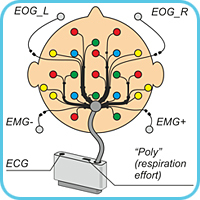 Original concept of unification of hard- and software for electroencephalographs-recorders "Encephalan-EEGR-19/26" provides a unique opportunity of combination of autonomous patient transceiver-recorder ABP-10 with additional modules and sensors, which allows you to create unified multifunctional neuromodular diagnostic systems with synchronous recording of more than 30 different signals. Record by 3 ECG channels and 1 impedance-based pneumogram channel. Record of arterial blood oxygen saturation using SpO2 sensors. 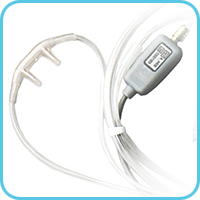 evaluates parameters of oral respiration and detection of breathing disorders basing on temperature changes of oral airflow. 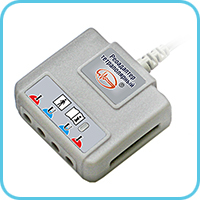 Connector EEG-9 with Defibrillation Proof is used in ICU when using cardiac defibrillator.